Finished Size: 9 3/4" in dia. Gauge: 2 rounds = 1/2"/3 trc = 1/4"
Ch 8; join with a slip st in first ch to form a ring. Rnd 1) Ch 3 (counts as first dc, now and throughout); 19 dc in ring; join with a slip st to first dc: 20 dc. Rnd 2) Ch 3, dc in next dc, ch 2; * dc in next 2 dc, ch 2; repeat from * around; join with a slip st to first dc: 20 dc/10 sps. Rnd 3) Ch 3, dc in joining, dc in next dc, ch 2; * 2 dc in next dc, dc in next dc, ch 2; repeat from * around; join with a slip st to first dc: 30 dc. Rnd 4) Ch 3, (dc, ch 1, dc) in next dc, dc in next dc, ch 2; * dc in next dc, (dc, ch 1, dc) in next dc, dc in next dc, ch 2; repeat from * around; join with a slip st to first dc: 40 dc. Rnd 5) Ch 3, dc in next dc, ch 2, dc in next 2 dc, ch 3; * dc in next 2 dc, ch 2, dc in next 2 dc, ch 3; repeat from * around; join with a slip st to first dc: 40 dc. Rnd 6) Ch 3, 2 dc in next dc, ch 1, 2 dc in next dc, dc in next dc, ch 3; * dc in next dc, 2 dc in next dc, ch 1, 2 dc in next dc, dc in next dc, ch 3; repeat from * around; join with a slip st to first dc: 60 dc. Rnd 7) Ch 3, dc in next 5 dc, ch 5; * dc in next 6 dc, ch 5; repeat from * around; join with a slip st to first dc. Rnd 8) Ch 2, dc in next 3 dc, 2 dc cluster over next 2 dc, ch 5, sc in next space, ch 5; * 2 dc cluster over next 2 dc, dc in next 2 dc, 2 dc cluster over next 2 dc, ch 5, sc in next space, ch 5; repeat from * around; join with a slip st to first dc. 2 dc cluster: (Yo, insert hook in next dc, draw up a loop, yo, draw through 2 loops on hook) twice, yo, draw through last 3 loops on hook to complete the stitch. Rnd 9) Ch 2, 3 dc cluster over next 3 sts, (ch 5, sc in next space) twice, ch 5; * 4 dc cluster over next 4 sts, (ch 5, sc in next space) twice, ch 5; repeat from * around; join with a slip st to the top of first cluster. 3 dc cluster: (Yo, insert hook in next dc, draw up a loop, yo, draw through 2 loops on hook) 3 times, yo, draw through last 4 loops on hook to complete the stitch. 4 dc cluster: (Yo, insert hook in next dc, draw up a loop, yo, draw through 2 loops on hook) 4 times, yo, draw through last 5 loops on hook to complete the stitch. Rnd 10) Ch 1, sc in joining, ch 3, (3 trc, ch 3, trc, ch 3, 3 trc) in center ch 5 space, ch 3; * sc in top of next cluster, ch 3, (3 trc, ch 3, trc, ch 3, 3 trc) in center of next ch 5 space, ch 3; repeat from * around; join with a slip st in first sc, slip st in ch 3 space and next trc. Rnd 11) Ch 3, 2 trc cluster over next 2 trc, ch 3, 3 trc in next space, ch 3, trc in next trc, ch 3, 3 trc in next space, ch 3, 3 trc cluster over next 3 trc, ch 3; * 3 trc cluster over next 3 trc, ch 3, 3 trc in next space, ch 3, trc in next trc, ch 3, 3 trc in next space, ch 3, 3 trc cluster over next 3 trc, ch 3; repeat from * around; join with a slip st to top of first cluster, slip st in next space and next trc. 3 trc cluster: [Yo twice, insert hook in next st, draw up a loop, (yo, draw through 2 loops on hook) twice] 3 times, yo, draw through last 4 loops on hook to complete the stitch. Rnd 12) Repeat Round 11. Rnd 13) Ch 3, 2 trc cluster over next 2 trc, ch 3, 3 trc in next space, ch 3, trc in next trc, ch 3, 3 trc in next space, ch 3, 3 trc cluster over next 3 trc, ch 4; * 3 trc cluster over next 3 trc, ch 3, 3 trc in next space, ch 3, trc in next trc, ch 3, 3 trc in next space, ch 3, 3 trc cluster over next 3 trc, ch 4; repeat from * around; join with a slip st to top of first cluster, slip st in next space and next trc. Rnd 14) Ch 3, 2 trc cluster over next 2 trc, ch 3, 4 trc in next trc, ch 3, 3 trc cluster over next 3 trc, (ch 5, sc in top of next cluster) twice, ch 5; * 3 trc cluster over next 3 trc, ch 3, 4 trc in next trc, ch 3, 3 trc cluster over next 3 trc, (ch 5, sc in top of next cluster) twice, ch 5; repeat from * around; join with a slip st to the top of first cluster. Rnd 15) Ch 1, sc in joining; * 3 sc in next space, sc in next trc, ch 3, 2 trc cluster over next 2 trc, ch 3, sc in last trc, 3 sc in next space, sc in top of next cluster, (ch 3, sc in last sc made) (picot made), (5 sc in next space, sc in top of next cluster, picot) 3 times; repeat from * around; join with a slip st in first sc. Fasten off, secure ends. 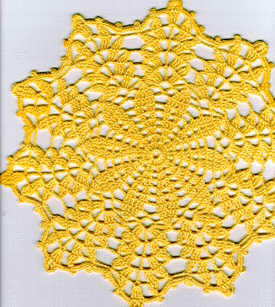 Lightly spray water or spray starch, if desired, over doily, cover with a handkerchief and press on the wrong side using a cool iron setting.